Details of the Hall family living in and around Grewelthorpe, Kirkby Malzeard etc. Taken from census returns and parish records. Research started Dec 2014. Updated Jan. 2019. Letter from Brian Hogarth [Nov 2018]. —- doing a bit of research on Alfred Hall who certainly had a connection with Masham, as I have in my possession a pewter teapot presented to him in 1902 by The postal staff of Masham when he left that service. It came into my keeping upon the death of my aunt who was his grand daughter, when I cleared out her home in Bishop Auckland 5 years ago. Her grandfather (on her mother’s side) served with The Green Howards in the Boer War so I suspect he enlisted in 1902 hence his leaving the postal service. He had a service medal from that conflict which I donated to the Green Howard museum in Richmond as was my aunt’s wish. I am not sure of his life thereafter but he lived in Spennymoor during WW2. I have no information at all about his marriage but he had one daughter Margaret or possible Marjorie who became Thompson upon marrying. They had one only child; my Aunt Joan, born 1938. Margaret was widowed in 1942 when her husband was lost overboard from a destroyer. — if there are any remaining Hall relatives I would like them to have this teapot. I have no connection whatsoever with the Hall family myself. My aunt had no children so no-one to pass this onto. I also have quite a few of her father’s war records so perhaps this might also be of interest. If you can put me in touch with anyone I will be very grateful. If anyone can help Brian please contact the site. ALEX E.HALL. Born 31 Dec 1909. Poultry farmer. Married to Mary E. [born 1906]. She was a grocery shopkeeper. In 1939 they lived in Sawley at the Stores. ALEX G.HALL. Born 6 Feb 1939. Son of Alex E. & Mary. of Sawley. ALFRED HALL. Born C1881 Masham. Grandson of John & Susanna Brand. ALFRED HALL. Born C1898 Kirkby Malzeard. Son of John & Hannah. Living Grewelthorpe 1911. ALFRED HALL. From Kirkby Malzeard killed in France on 2 Nov 1918. Regt No. 77687. Durham Light Infantry. 1st 7th Battalion. ALICE MAY HALL. Born C1906 Grewelthorpe. Dau of John & Hannah. ANNIE HALL. Born C1886 Kirkby Malzeard. Dau of John Wm & Mary Annie. Unmarried in 1911. School teacher. CHARLES HALL Born C 1857 Hackforth. Son of John & Susanna Brand Mason & Builder. u/m 1881. DOROTHY RUTH HALL. Born C1896 Kirkby Malzeard. Dau of John Wm & Mary Annie. EDWARD HALL. Born C1854 Ripon. Son of Joseph [Pipe maker] & Margaret Thwaite. In 1871 Joiners App. EDWINA M. HALL. Born 11 May 1913. Dau of Maud. ELEANOR HALL. Born C 1890 Kirkby Malzeard. Dau of John Wm. & Mary Annie. Unmarried in 1911. School teacher. ELIZABETH HALL. Born C1862. Hackforth. Dau of John & Susanna Brand. ELIZABETH HALL Born C1871 Leeds. Sister of William. Niece of Robert Coldbeck [butcher] & Mary in Grewelthorpe in 1881. ESTHER HALL. Born C 1855. Catterick. Dau of John & Susanna Brand. GEORGINA HALL. Born 5 Nov 1896. Married ? Pitt. Living Sawley in 1939 a domestic servant at Sawley Hall. GEORGINA ELIZABETH HALL Died Dec. 26 1930 at Westfield House Grewelthorpe. Widow of the late Henry Shillito Hall of Ripon. Interred Ripon cemetery. Ref. Leeds Mercury 1930. HANNAH HALL [nee?]. Born C1868 Northallerton. Married to John of Masham. Living Grewelthorpe 1911. HAROLD HALL. Born 1892 Masham. Son of John & Hannah. In 1911 he was a Mason’s labourer. living Grewelthorpe. HARRY HALL. Born C 1890 Fearby. Son of John & Hannah. A mason. Living Grewelthorpe 1911. JAMES HALL. Born C1862 Ripon. Son of Joseph [pipe maker] & Margaret Thwaite. JAMES HENRY HALL. Born C1868 K. Malzeard. Son of Thomas & Ruth. JANE HALL. Married 8.5.1708 K.Malzeard to William Raynor. of Middlesmoor. JOHN HALL. Born C1827 Catterick. Son of William & Esther Lane. Married Susanna Brand of Richmond. He was a mason & builder. in 1885. They had 5 daughters. He was a stonemason. 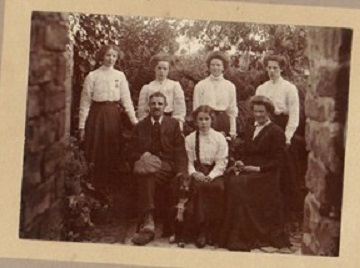 John William Hall & Mary & their 5 girls. Signature of John William Hall. 1918. JOHN J. HALL. Born 14 April 1890. Head game keeper at Dalton Hall. Married to Rhoda [born 1889]. JONATHAN THOMAS HALL. Born C1868 Masham. Son of John & Susanna Brand. Married to Hannah of Northallerton. Living Grewelthorpe in 1911. He was a stonemason. JOSEPH HALL. Born C1824 Kirkby Malzeard. In 1871 a tobacco pipe maker in Allhallowgate, Ripon. Married to Margaret Thwaite. from K.Malzeard. See Thwaite[s] page. KATE HALL. Born C1893 Kirkby Malzeard. Dau of John Wm & Mary Annie. LILY HALL. Born C1891 Kirkby Malzeard. Dau of John Wm & Mary Annie. LILY HALL. Born C1903 Grewelthorpe. Dau of John & Hannah. MARGARET JANE HALL. Born C1865 Masham. Dau of John & Susanna Brand. MARY HALL. Born C 1860 Hackforth. Dau of John & Susanna Brand. MAUD K.HALL. Born 7 Jan 1887. Living Sawley in 1939 Abbey View. with dau. Edwina. MINNIE HALL Born C1908 Grewelthorpe. Dau of John & Hannah. PERCY HALL. Born C1895 Kirkby Malzeard. Son of John & Hannah. In 1911 he was working at a grocers and meat dealers. RUTH HALL [nee?] Born C1830. Died 1912. Married to Thomas the Mason. In 1911 census shown as having had 5 children. 3 died. She was a widow. Mother of John William & Thomas Barnes Hall. SARAH A. HALL. Born C1854 Catterick. * Dau of John & Susanna Brand. THOMAS HALL Born C1830. Kirkby .Malzeard. Married Kirkby Malzeard. to Ruth. He was a mason in K.Malzeard in 1861. TOM HALL. Born C1856 Ripon. Son of Joseph [Pipe maker] & Margaret. In 1871 he was an errand boy. THOMAS BOWES HALL. Born C1866 Kirkby Malzeard. Son of Thomas & Ruth. He was a Mason’s Labourer. Unmarried in 1901. WILLIAM HALL. Born C1804 Catterick. Married Esther Lane in 1823. They had 7 children. WILLIAM HALL. Born C1869 Leeds. Brother of Elizabeth. Nephew of Robert Coldbeck [the butcher] & Mary in Grewelthorpe. Advert for house sale in 1945. Main Street Grewelthorpe. I think this property was next to the school. Ref. Yorkshire Post. Probably Hannah Hall’s house.